Waved after being recognised by passengers in a passing car. 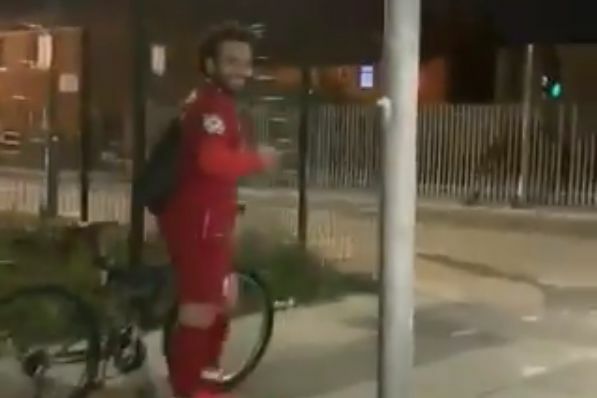 A passenger in a passing car noticed a Mohamed Salah lookalike in full Liverpool kit pushing a bike down the pavement alongside a road somewhere in the city. The man is seen in the evening light wearing a replica Liverpool shirt with Salah’s name and number on the back as well as the shorts, socks and football boots. He also appears to be sporting remarkably similar facial hair to the star midfielder, as seen when the doppelgänger turns around to greet the person who spotted him from their vehicle. The Salah lookalike seems pleased to be recognised and waves as the people in the car sing the player’s song to him.